In a major restructuring, e-commerce major Flipkart, on Monday, brought all its units under an umbrella firm and elevated Binny Bansal (left) as group chief executive officer. Kalyan Krishnamurthy, currently heading the category design organisation, will become the CEO of Flipkart. co-founder Sachin Bansal will continue as executive chairman. "We are now ready to build the Flipkart of the future as we continue on our journey of transforming commerce in India through technology. I am confident that this new organisation structure will deliver further value for Flipkart group," Flipkart group CEO Binny said in a statement. The development comes within a year of the previous high level rejig at Flipkart when Binny Bansal, then chief operating officer, was appointed Flipkart CEO, replacing Sachin Bansal, who was appointed executive chairman. "Kalyan Krishnamurthy, currently heading the category design organisation will become the CEO of Flipkart. Kalyan will be responsible for operationally driving Flipkart and will be responsible for Flipkart P&L," the statement said. Krishnamurthy joined Flipkart in June from Tiger Global which is one of the largest investors in the e-commerce firm. Ananth Narayanan will continue as CEO of Myntra-Jabong and Sameer Nigam as CEO of PhonePe. Flipkart, Jabong-Myntra and PhonePe will operate under this group structure and their CEOs will report to Binny. Flipkart Group Organisation will focus on building a portfolio of new, high value-creating businesses that are disruptive and will transform commerce in India, it said. "To evaluate these opportunities and construct this portfolio of new businesses, Flipkart Group Organisation will have a Group Strategy function as well as mergers and acquisition," it said. The other key responsibility of Binny as Group CEO will be to oversee capital allocation across all the group companies, CEO selection and CEO compensation. "Nitin Seth, presently the Chief Administrative officer, will be the COO for Flipkart. 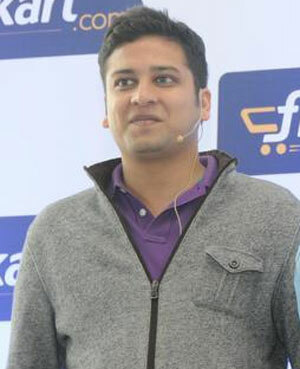 In his new role, Nitin will be responsible for Ekart and customer experience in addition to his existing role leading HR, strategy to execution capabilities and corporate functions for Flipkart," the statement said. Nitin will report to Krishnamurthy. Categories, marketplace, customer shopping experience, private label and marketing will continue to report to Krishnamurthy. In addition, the engineering division led by Ravi Garikapati will now report to Krishnamurthy. Flipkart is in the process of hiring a group CFO and general counsel and both of them will also report to Binny. Saikiran will transition from his role as head of supply chain to lead the efforts to set up the Group CEO's office and assist Binny. Sachin will continue to be the executive chairman and will work closely with Binny on the new business portfolio.